Horizon Zero Dawn is one of the best games I've ever played, and frankly, one of the best looking video games ever crafted. Its combat was fast, ferocious, and made even more impressive due to its robotic cast of creatures that you could literally dismember with a well-placed arrow or set up traps to bring that lumbering beast down to the ground. I'll be honest, when I installed the Frozen Wilds, an expansion to the main game, I was a bit intimidated to jump back in and get back into the groove of all the weapons, systems, and mechanics that took me days to initially master back when the title first released this past spring. It took me all of six seconds for everything to just flood right back to me, as if I had just played it yesterday. The Frozen Wilds is meant to be played after you have completed the main story of Horizon Zero Dawn, where you are then dropped back into the large open world at a point in time before the events of the final mission. The new content is recommended for at least level 30, but for those who have sunk dozens of hours into the large open world of the main campaign, it was easy enough to hit level 50 at the time. 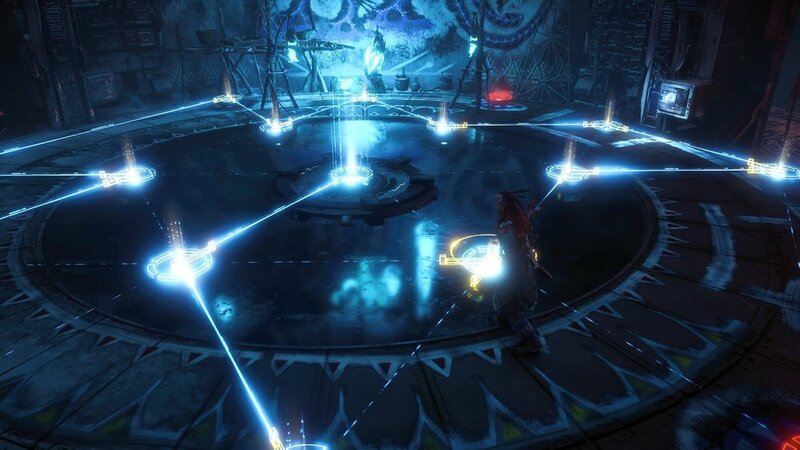 You'll need those extra levels and skill points to enhance the capabilities of Aloy as some of the new enemies that you'll encounter are much harder to take down than anything you've seen before. When Aloy hears about a strange new robotic menace, curiosity gets the better of her and she then departs for the Cut, a new expansive area that is covered in snow and ice. Where most games would have this content accessible through a menu or some other form of loading screen access, you can merely climb and traverse your way right into it, as if it had been there all along. Where Horizon Zero Dawn had already treated us to a massive open world, The Frozen Wilds makes that map just a little bit bigger. The main story of this expansion centers around the Banuk Tribe and their attempts to investigate strange disturbances that have been plaguing their lands. You'll soon hear talks about a Shaman that has retreated up north to seek answers, or that the previous expedition to discover the source of these new creatures was all but wiped out. The Frozen Wilds dives deeper into how the tribe works, its structure and faith, and Aloy will become all too familiar with it and its people during the 10-12 hour campaign. What was impressive about Horizon Zero Dawn was the cast of characters you met along the way felt fully realized and enjoyable to encounter. The same holds true here as we are once again treated to a memorable cast of characters not only during the main story but the side quests as well. Fundemantely, The Frozen Wilds plays exactly as the main game does and that should come as no surprise as you shouldn't really look to mess with perfection. While that may sound a bit generous, it really isn't as Horizon Zero Dawn is hands down one of the best games released this year. Aloy will have access to everything you had during your time with the game as well as six new weapons to add to the mix. The Banuk Stormslinger fires charged bolts with consecutive shots building up a larger charge to deal increased damage. The Forgefire is pretty much a flamethrower, whereas the Icerail is an Ice-thrower. You'll also have the Banuk Powershot Bow, Striker Bow, and the Champion bow. You will unlock the first three through quests while the remaining are purchased with a new currency called Bluegleam, which is given out for completing quests and discovered in rare amounts across the new winter biome. Aloy will also see an upgrade to her spear upon completing a quest given out shortly into the DLC. Each of the new weapons will see upgrades dished out upon completing certain quests and all the crafting systems that were in place last time are all here again with even more modifications to mix and match to your heart's content. I do wish the inventory space saw an upgrade as my bags were already full when I started the expansion and I spent a solid 20 minutes sorting and selling to make room for all the new goodies. While there is a new perk that allows you to efficiently break down items, it just isn't enough. I still appreciate that Horizon Zero Dawn attempts to fix certain busywork elements of open-world RPG's by making it easier to locate items for crafting by creating sub-missions to locate that much-needed resource and the new skill tree even has an upgrade to allow you to collect items while on your mount, a system that I want to see implemented in every game of this genre. Another element to crafting that Horizon Zero Dawn gets right is the ability to craft ammo on the fly, right in the thick of battle. It worked remarkably well during the main campaign and can be a lifesaver here due to the excessive beating that several of the new enemy types can take. The Cut is a fair size location that is buried in snow and covered in ice. While the main world of Horizon Zero Dawn did have a winter-themed area, it wasn't near this impressive and for those wondering about this location feeling the same all the way through, the $20 USD DLC offers a wealth of variety despite the single winter setting. There are numerous areas on the map that contain a lot of color in the decoration of certain encampments, as well as many caves and caverns that open up to vast underground locations. The dungeons, which are called Cauldrons, return here but there is only one single location to explore. It's probably the biggest Cauldron to date and you won't explore it alone. This team-based mission has you attempting to create paths for your AI companions to follow you and makes for some fantastic conversations and action set pieces. The game is also packed to the brim with new audio and text files that will shed even more light on the in's and out's of the narrative that is placed in the background of the core story. I will say that upon completing the DLC campaign that it can lay on the exposition really thick and go into such immense detail about what has occurred not only in the Cut but how these situations affect you and your main quest as well. I found it to drag on a bit too much during this moment, but in the end, I am glad it is at least there. The side quests featured in the Frozen Wild don't quite hit the highs of the main game, such as any time you were paired with Nil, but they do entertain. I thoroughly enjoyed a quest to find a trio of warriors who owed a shopkeeper some machine parts, as they attempt to find their place in the world, as well as a name for their group. Another favorite of mine was teaming up with a man trapped in a water control facility as we flipped switches and rotated valves to lower the water level. It may sound very trivial, but the man's sense of humor and tone really made it a personal favorite of mine. There are a few new threats for Aloy to take on as you attempt to master not only which weapon is right for the job, but the behaviors each of these new creatures exhibit. The Scorcher is a new canine-like machine that can be very quick to attack and difficult to avoid. The Frostclaw is basically a giant robotic Grizzly bear, complete with some very interesting attacks that make it by far the most unique entry to the DLC. The Fireclaw is quite similar to the Frostclaw except for the reverse of Fire and Ice. It's also considerably more challenging in every regard. There are Control Towers that have sprouted up in several locations and these can repair damaged machines nearby, so making these a priority is a must. These can be either hacked with your spear or destroyed via the canister on its side. It's also worth noting that these Towers can shut down your Shield Weaver armor as well, so these are not something to ignore during an intense battle. Lastly, you'll encounter variations on existing enemies as these are somewhat possessed by the central evil force featured in the story here and can provide a much harder challenge for those expecting to apply the same overall tactics as last time. As was the case with the main game, the voice acting is superb with not a single line of dialogue performed poorly or feeling out of place in the game. Ashly Burch gives yet another tremendous performance as Aloy and it is enhanced by the rich cast of characters that surround her. Necar Zadegan as Ourea, the Banuk Shaman, is truly remarkable here and a real stand out in the game. The determination in her voice, and the stellar work on her character model, really has you get behind this woman and her beliefs. Richard Neil, Ourea's brother, Aratak, is a stubborn Chieftain who doesn't share the same views as his sister and has almost left her behind in many ways. Both of them have to see eye to eye in many aspects of the story, and they do a masterful job at doing so. I also have to complement Guerrilla Games on the use of repeated actions have different audio samples like hearing how the corridor is a dead end but there is some treasure to loot. This particular example had at least four different lines of dialogue that would swap out every now and then, making the dialogue feel believable and natural. Horizon Zero Dawn is frankly, the best looking game on the PS4, and shines even more so on the PlayStation 4 Pro. The lighting, the textures, and the art design is incredible and The Frozen Wilds is no exception. This game features the most realistic snow I've seen in a game with characters rolling into it and causing it to compact below them. The use of color in these white-out areas is expertly placed, and even a few enemies will have color decor on their horns as well. While it doesn't run the palette as well as the main campaign with the sheer variety of locales, it does still impress as much as it can. I never once notice any sort of visual flaw, even down to the most far-placed NPC. The Frozen Wilds only has one apparent flaw, and that is it is the only piece of story DLC we are getting. This content is feature packed and frankly, I just want more. I love the combat, the characters, and the world Guerrilla Games have created here. Aloy is a compelling character who cracks wise when she needs too but never becomes a cliche trope. The action, no matter the difficulty, feels organically fun and each kill feels earned, and each death a result of the lack of your skill and not the controls. The story told here is enjoyable, personal, and can get a fair bit emotional as well, as two siblings who are worlds apart must find common ground if they are going to survive. The Frozen Wilds is a great addition to Horizon Zero Dawn and it makes waiting for the sequel that much harder. PUBLISHER - sony interactive ent. HZD: The frozen Wilds WAS PURCHASED BY THE REVIEWER. ALL SCREENSHOTS WERE TAKEN ON ps4 pro.